A subdomain is an extension of your domain name; a prefix that allows you to use URLs such as blog.HostingAccountDomain.com, forum.HostingAccountDomain.com, etc. 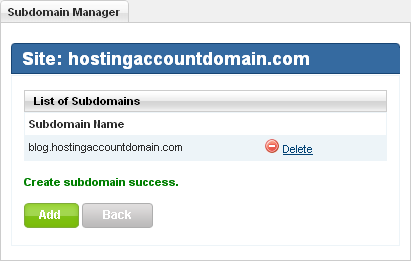 A subdomain typically routes traffic to a specific subdirectory within your account. 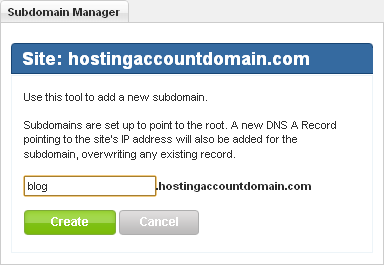 To create a subdomain, log in to Control Panel, click the “Sites” tab and click the “Manage” link for the domain you wish to work with. 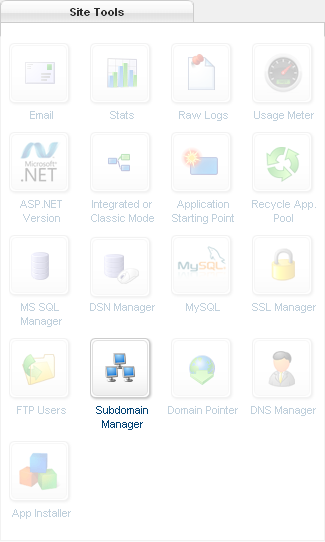 In the Site Tools section, click the “Subdomain Manager” icon or link. Next, click the “Add” button. Enter the subdomain and click the “Create” button. Finally you’ll see confirmation that your subdirectory has been created. 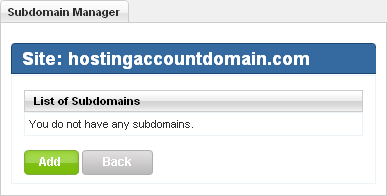 For tips on redirecting subdomain traffic to a subdirectory, see this Knowledge Base article, or our forum.